Which digital tools do you use to make your life easier? I've been thinking this week about all the apps, tools and plug-ins that I use to make my digital life easier. I use a variety of tools to catch up with digital conversations, save things for later and to make sure I don't miss blogposts. I also use them to manage my own digital footprint so I can update blogs and twitter when I am away from my desk and laptop. There are lots of options out there so I want to collect a round up of what people use and for what. I'm particularly interested in hearing from researchers. 98% of the tools I use are free and I am reluctant to pay for something new without a really good review first. New tools are launched on a what seems like daily basis and older apps and tools get changed, removed and updated frequently. Here's a run down of what I use (and for what). I would be really interested to hear from others about what they use and how it makes your life easier! - Twitter - I use twitter.com from my desktop and laptop and the twitter app from my phone. I don't schedule tweets. I use favourites and lists to make sure I don't miss tweets from people that I am interested in and save posts and links to read at a later time (although I very rarely go back and read things that I have favourited). I have started to look at using tweetdeck as an easier way of managing multiple twitter accounts. I have also dabbled in hootsuite but to be honest I found it made my life more difficult rather than easier (sometimes too many options is a bad thing). - Storify - really useful for capturing twitter conversations and for sharing them with others. 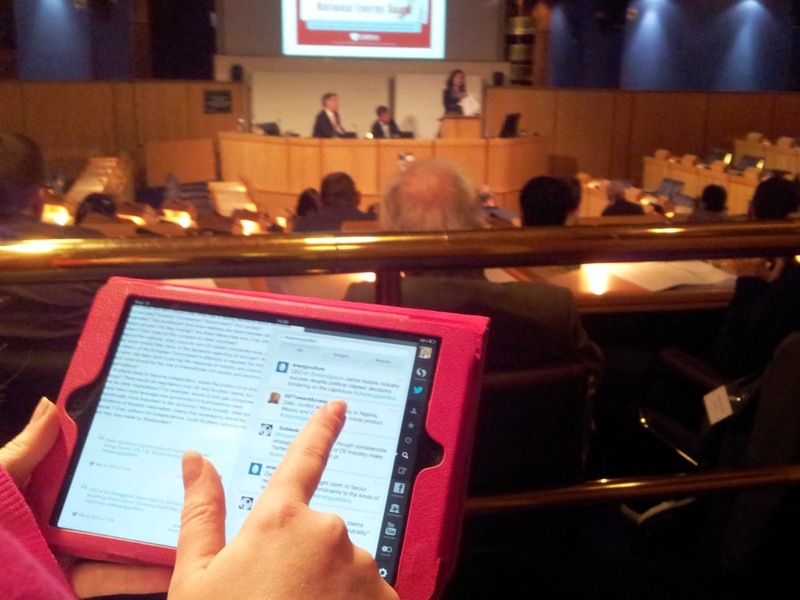 Super useful for capturing live tweets as they happen at conferences. - Facebook - I just use the facebook app on my phone. I mostly use facebook for personal posts but I do manage a few pages and do that via the pages app. - Updating my blogs - I use blogger and wordpress. I use their apps so I can update on the go. I find both apps a little tricky to use from my ipad and iphone as writing isn't easy and editing is even more difficult. They are both useful for uploading photos direct to a blog from my phone and jotting down notes which I can then turn into a blog post at a later date. - ifft - if this then that. A brilliant tool to automate your online activity. I used ifft to automatically collate guest pictures from my wedding! I saw someone instagraming something on the day and felt a little bit smug knowing that it would be waiting for my on my flickr account to look at the following day! - Reading Blogs - I use bloglovin on my ipad. I read a mix of blogs from cooking, design, gardening, beauty (yup) and science blogs. I like the simple design of bloglovin so I can get to the content I want to read easily. I've tried other apps but find that nicer designs can detract from finding the content I want, quickly. - Capturing interesting stuff and writing notes - I use evernote. I have a plugin for Chrome so I can screenshot and save pages from my desktop and laptop. I also have Everclip and Evernote on my iphone/ipad. You do need to pay for these but they are totally worth it. I am awful at categorising things properly so the search option within my saved clippings and notes in evernote is a godsend. Please share what you use, for what and how you use it. I expect this page to evolve and keep updating as I will undoubtedly start using new tools and apps as I change how I navigate online and also as new ones appear! @hapsci @easternblot Thanks for sharing - great list. +1 to the Trello comment - found it useful for #okfest14. Also, Topsy for tweets. @hapsci I'm a big fan of @poppletny for mind mapping new ideas and visualizing them - neater than my ineligible handwriting in my notebook! I use Pocket to save links to read later. I literally add 50+ links some days because of all the things I see on twitter (and a few from facebook). The IOS app is very nice, and there is also a Mac version too that all syncs seemlessly. The Chrome extension is brilliant. And finally, I manage my social media using buffer. Schedule tweets/re-tweets for the next day or week even at 2am when none of my followers are actually reading. Many of the iOS apps I use integrate well with buffer including pocket (mentioned above) and feedly (my RSS reader of choice). I've heard a lot of people say they use pocket but I'm not sure how different it is to evernote? I've never used it. Not heard of Notional Velocity or buffer! Thanks for sharing those!! I'm going to check those both out! Hi, Pocket is different because its whole purpose is just to save web links to read later on whatever mobile device or computer you happen to be on, and easily archive and search them. Evernote is more of an organizational tool to save notes, pictures, manage projects etc. 2 very different use cases. I'm a huge fan of Hootsuite. I did prefer the UI in Tweetdeck but it's just not as adaptable as Hootsuite. I love having different tabs for each account, each tab including #searches, lists as well as home feeds, mentions and retweets. Tweedle on my phone which I think is so much better than the standard Twitter app; I'm on Android so I'm not sure if it's available for iGadgets. Feedly to keep on top of blogs, I thought it was the best alternative after Google Reader was retired and I was able to migrate all my blogs across from Google. Blogspot for blogging (though not about science); unfortunately the Blogger app for Android is rubbish (stupidly - maybe the iGadget one is better), so I usually write blogposts in Drive so I can edit them wherever I am. So I use Drive and Dropbox like a boss; I'm finding the public folder in Dropbox very useful for sharing pdfs of publications/recruitment adverts to twitter. I also use Evernote, but I've only just started to use it so I probably haven't found it's full potential yet. I also have the Clip extension for Chrome and found it very useful. I used Google Keep for a bit, but it's very basic and only have text lists in it. I quite like the idea of Trello though, I may have a go at that, I see I can login with Google - even better. I use Facebook personally, but not very much, I much prefer Google+; I love that it supports Gifs, #autoawesomes, and I get far more feedback from Blogposts I put there than I do on Facebook. I think of it like Twitter (in that you connect with people who share an interest, rather than friends), but you can say a whole lot more. Anyway, it's about time I shut up and did some work!